Jonah is the fifth book of the Minor Prophets, written around 780 B.C. It is an historical narrative containing spiritual truths and a record of supernatural acts of God. Jonah lived before the Assyrian invasion and destruction of Samaria. (2 Kings 14:25) Jonah preceded Amos and ministered in the northern kingdom under Jeroboam ll. Nineveh, where Jonah was called to minister to, was the capital of Assyria. Jonah probably preached before the Assyrians’ rise to power. It was the main city in a relatively weak kingdom,; within 50 years it would become the capital of the huge, wicked and cruel Assyrian Empire. The city was a grave threat to the security of Israel. Jonah foresaw what was to come and his hesitation is understandable. But God wanted to widen the prophet’s heart. Jonah’s story is an illustration of God’s mercy and grace to the Ninevites and also to Jonah. As you read Jonah, we will see God’s love and compassion, realizing that no one is beyond redemption. The gospel is for any who will repent and believe. May we grow in the wideness and the mercy of God and deliver the message of salvation to a world lost in darkness. First, Jonah was called to preach (1-3). God had a difficult mission for Jonah: to be a foreign missionary to Nineveh. The city was a threat and wicked. An Israelite had every reason to hate and fear the Ninevites. How could Jonah preach the message of salvation these Gentile people? Jonah was not strong enough to obey and ran from the Lord. Jonah’s attitude is representative of all who are reluctant to share God’s grace with others who are their enemies, yet are called to love them. Second, Gentiles trusted in the Lord (4-17). Jonah knew what God required and he gave up, volunteering to be a living sacrifice. Jonah was also fully aware of his own guilt and made no excuses. He confessed the facts. God was leading Jonah to the perfect place where he could confess, repent, discover God’s grace and embrace God’s mission. God was also helping the sailors to have faith. The LORD knows the best way to reveal himself. First, God delivers us, many times at the last moment (17). Noah had resigned himself to his fate, but God had other plans. He sent a huge fish to save Jonah’s life. God intervenes, humbles and saves…more often than not, at the last moment. Second, Jonah responded well to God’s training (2:1-10). Jonah did not act as an ordinary person. He was not bitter. Jonah’s mind was elevated above his miserable situation. He turned heavenward, to God, in prayer even from inside the belly of the fish. Jonah remembered the grace of God and had a song in his heart. He thanked God and made vows, which is making a commitment to God. In the process, he had an epiphany of truth, discovering that salvation comes from the Lord. Jonah knew that he was the most blessed. It was because he could experience the grace of God. Whoever turns to the Lord in their need will see the glory of God and be filled with songs of thanksgiving and praise. First, Jonah was called to preach God’s message (1-4). Jonah was to preach what God told him to preach: a message of judgment to a powerful city. We are also called to preach God’s message to the popular culture without compromising it. Such a message is unpopular. But we should never give into the social consensus. God wants all people to come to repentance and salvation. His message is the only message that can purge idols, bring forgiveness of sins and eternal life. Second, a miracle happened (5-10). When Jonah obeyed, a miracle happened. The city repented. God honored Jonah’s preaching and their response. We are tempted to think that nobody would listen to God’s message. But if we simply proclaim what we know about God, we will be surprised at how many people will listen. Expect great things from God when we preach his word. ONE WORD: Hold out the word of God. God will work through his word. First, Jonah prayed even when angry (1-3). Jonah’s ministry was fruitful, but he was bitter at the outcome. Anger makes it hard to pray. But God drew him to pray. Through his prayer we discover that God is gracious and compassionate towards all kinds of people. God reveals himself to those who call upon him, even to those stewing in anger. Second, the lesson of the vine (4-11). God taught Jonah compassion through a vine, a worm and hot wind. 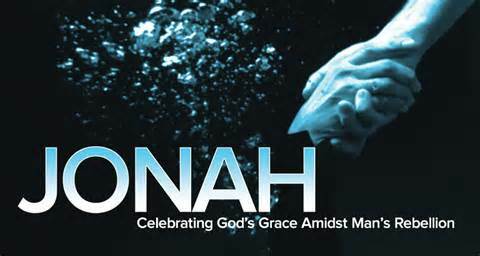 Jonah was thankful for personal grace given to him. But he needed to mature to begin hoping that other people may be blessed. God provided a worm, which killed the vine in the heat. Jonah was uncomfortable, inconvenienced and grew faint. He snapped. The people of Nineveh were withering in sin, but God saved them. God’s compassion extends to Jonah and to the Ninevites. Jonah needed to learn this to be a servant of God.